One of our recent purchases was a sprinkler system as part of our landscaping project. I've never watered my lawn all that much, but now with the nice new sod and landscaping I'd like to keep the plants from all dying and having it look bad and wasting that investment. Anyway, we'll want to water our lawn and plants with the automatic sprinklers. I figured I should find out how much it will cost. Our water bill covers 2 months and we just got the last bill. So I won't be able to see the cost of watering the lawn for a full 2 months. I wanted to estimate the cost before hand so that we don't get surprised by a very large bill. My city charges $2.5 about / ccf for water and sewer charges (1 ccf =748 gallons). Our water costs around 0.33 cents per gallon. If we use significantly more water then we could hit the next tier of rate and it would get up to about $3 / ccf or 0.4 cents/gallon. First estimate is based on simply running the sprinklers 30 minutes a day and guesstimating the amount of gallons per minute the system would put out. I don't know exactly what kind of hardware they used or what they are rated at but you can find sprinkler heads on the net. This Rainbird sprinkler head says it uses 2.5 to 4.3 gallons per minute (gpm). This Rainbird model does 2.1 to 3.2 gpm. These Hunter sprinkler heads put out anything from 0.3 to 14 gpm. So the range of GPM per head is pretty wide. I believe we've got the smaller type heads that are probably more like 2-4 gpm. There are 5 heads in each zone in our lawn. So I guess we'd be using 10-20 gpm. 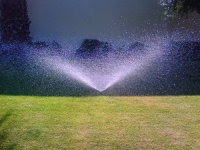 If the lawn is set for 30 minutes of watering total then that would be 300-600 gallons of water per water. That is 2100 to 4200 gallons of water a week. At a rate of .33 to .4 cents per gallon that would come to about $6.93 to $16.8 per week or $27.72 to $67.20 a month. This page says that the suggested GPM for a lawn sprinkler is 8 gpm. With 30 minutes of use a day that would be 240 gallons a day. Thats $23.76 to $28.80 a month. I probably shouldn't just water the lawn a full 30 minutes a day. AllAboutLawns recommends watering your lawn about 1" per week. For 1000 sq. ft. of lawn that would be about 83 cubic feet of water. A cubic foot of water is 7.48 gallons so watering a 1000 sq ft lawn 1" would take about 623 gallons of water or 2,492 gallons a month. So we'd be spending around $8.22 to $9.97 a month to water our lawn at the rate of 1" a week. Given the 3 different estimates I come out with estimated costs ranging from $8.22 to $67.20 a month. I think its a pretty good bet that the actual cost will probably end up somewhere in the middle in the $10-$30 range. Of course the exact amount we spend will depend on how much we decide to water the lawn. If we have it run 2 times a day every day then that will cost more than if we run it once a day every other day. This discussion on Gardenweb.com has some people citing their lawn watering costs. There is one person paying $150 a month for 7000 sq ft of lawn. Another person spends $100 to $250 a month for 1/3 of an acre. This article on Slate estimates that average American lawn uses 21,600 gallons a year. AT my 0.33 to 0.4 cent rate per gallon that would be about $71.28 to $86.4 per year.